When metal working tools became wide-spread in the U.S. in the late 1800’s and early 1900’s banjo makers went wild with banjo tone ring designs. Brass is usually the metal of choice for tone rings. There are many different kinds of tone rings out there today. I’ll touch on just a few of them here. The simplest tone ring is no tone ring. Some banjos feature a beveled edge where the head sits on the rim with no tone ring at all. I have heard some really good sounding old-time banjos with this feature. Rolled brass is about as plain as a metal tone ring gets. It is a piece of round brass rolled into a ring that matches the outside circumference of the rim. I like this type of tone ring very much. It has a great old-time sound and may be my favorite. 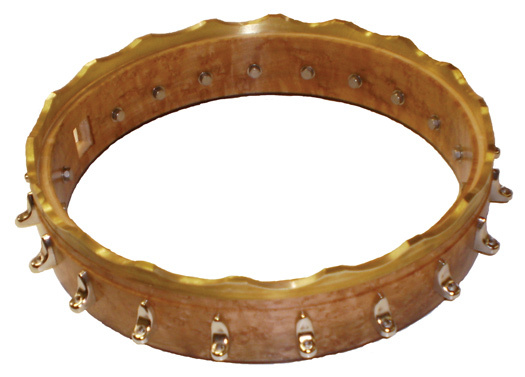 The plain rolled brass tone ring is also the easiest to plan for when building a banjo. A plain rolled brass tone ring. The Little Wonder banjo tone ring is much like the plain brass one, except that it has a spun brass, often nickel-plated sleeve that sits over the brass ring. The Little Wonder is a tiny bit louder and brighter than the plain brass ring. It also requires a little more work with the lathe, or possibly the router, as a very small ledge must be cut into the outside of the rim to make room for the sleeve. The idea is to make the sleeve flush with the outside of the rim. The Whyte Lady banjo tone ring is similar to the Little Wonder in that it features a brass ring trapped by a sleeve. However, the Whyte Lady also incorporates the use of another scalloped ring underneath the round brass ring. The Whyte Lady offers a bright clear tone with a good bit of volume. This tone ring requires a ledge to be cut into the top edge of the rim for the scalloped ring to sit on and a smaller ledge to make the outer sleeve sit flush with the outside of the rim. A banjo rim with a scalloped secondary tune ring for a Whyte Lady. The Tubaphone represents the loudest of the tone rings commonly found in open back banjos used for Old-Time and Clawhammer playing styles. It also features the brass rod trapped by a sleeve, only this one sits on top of a hollow tube with holes drilled into it. They’re bright and loud! The lathe work for the tuba-phone is similar to the Whyte lady. The “tube” part of the tone ring for the Tubaphone tone ring.